The eventful conclusion to the Atlanteans series. Jumping right into the action three days after the events of The Dark Shore (2013), the narration gives a minimal recap of the complicated events and large cast. Owen and Lilly, newly revealed to be the Medium of the Three Atlantean descendants prophesied to save the world, desperately race on to beat villainous Paul to both the Paintbrush of the Gods (a powerful tool that can restore the failing climate and rapidly dying planet) and the Terra (a personified spirit of the Earth). 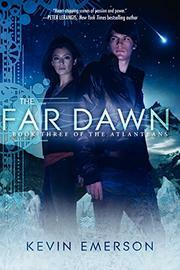 However, the Terra has a message for Owen: The prophecy of the Three’s a lie, and they will fail. Owen must discover what that means and why he can communicate with the Terra even though he isn’t the Medium. On the action-packed journey, he encounters a strange ally who enables an extended flashback to the original Atlantean Three in the days leading up to their disaster and the history of the Paintbrush of the Gods—the sequence takes readers away from the main plot for a long time, and much of it reads like an infodump, but it’s necessary information containing surprising revelations. A thematic buildup leads to a choice between saving the world and saving personal love—the execution’s surprising, believable and refreshingly true to the characters. The ending more than satisfies without being too tidy.